In celebration of Brownie Day we have not only rounded up some of the best recipes but, if you would rather buy some ready made, we have picked some good uns for you to buy too! Featured is the award winning Heathcliff Orange and Almond Brownie made from ground almonds and molten chocolate, so it's gluten free too! Gluten free dark chocolate brownie with orange and almonds. 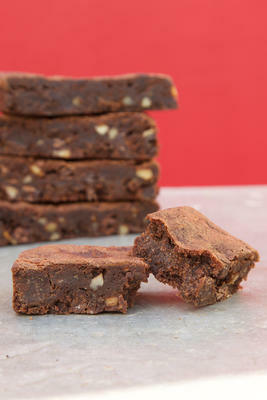 Like it’s sister brownie (the Milk Chocolate Brownie), Heathcliff’s base is made from ground almonds & molten chocolate. It’s dark chocolate all the way- both molten & chunks. Made with a blend of two dark chocolates, one is 54% cocoa solids and one is 70%. Chocolate content is 40% of overall ingredients. We use a cold pressed orange oil & orange zest. The Heathcliff is beautiful served either warmed through- pop it in the oven after you’ve cooked supper. Equally as lovely served from the fridge & cut into slivers- served then with coffee. Heathcliff Brownie is a Great Taste Gold Award Winner.